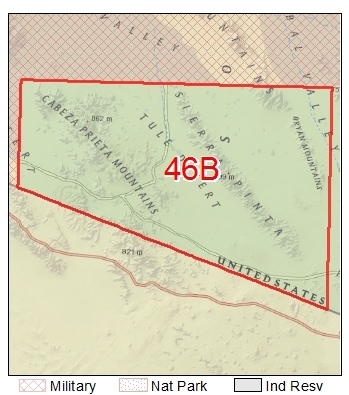 That portion of the Cabeza Prieta National Wildlife Refuge west of the Yuma-Pima County line. Overview: Desert Bighorn Sheep can be found throughout the Sierra Pinta, Cabeza Prieta, and Tule Mountains. Past rams harvested have scored 125 and 170. I recommend hunters to scout early, to allow themselves plenty of time to explore all areas and especially see as many sheep as possible. In late August and into September the rams are in the rut; excellent opportunity to observe several rams in fewer areas. Keep in mind that the temperatures will range into the hundreds and that its monsoon season. Between personally dehydrating and being stranded by flooded washes, please use common sense and be prepared for desert survival. The rams you may have observed in September will not necessarily be there by December. Mature rams have been known to roam in small bachelor groups or be solitaire; do not over look adjacent small hills to a large mountain as your hunt approaches. The Department completes sheep surveys by October. Note – not all units are surveyed each year. A strategy for your hunt; round up friends prior to your hunt, to scout out the unit. The more eyes helping you look will increase your odds in finding them. A great time to carry a camera or video camera. By late November, you should have a good feel where to start your hunt. Hopefully you have in your mind the ram you plan to harvest from your earlier scouting effort. In locating sheep, the preferred method is to observe with an at least a 10 or 20 power binocular/scope first from the base of the mountain. This allows sheep plenty of escape room and sheep that are there may stay and watch you. Otherwise, a direct assault on the mountain will more likely send sheep fleeing before you see them. As curious as sheep are, they may watch you approach without running. Make an indirect approach, as if you're searching for your keys (avoid eye contact), you'll surprise yourself how close you may get. Practice this technique during your scouting effort. When you are on the mountain, stay within the first two-thirds of the way up; the third above you will still provide sheep escape room. Regularly stop and sit and listen as you use your binoculars. Chances are you'll hear sheep before you see them, as rocks fall from the sheep's movements. If drawn, guides and taxidermist will find you. I recommend you attend the October sheep clinic held each year in Phoenix, sponsored by Arizona Desert Bighorn Sheep Society, ADBSS. You can ask questions in person to wildlife biologists, wildlife managers and various government agencies that administer the land your hunt is on. If you're not drawn, I encourage you to participate as a helper in a sheep hunt. Areas: Contact the Cabeza Prieta National Wildlife Refuge at 1611 N. Second Ave., Ajo, AZ 85321 (520) 387-6483. Ajo is located 40 miles south of Gila Bend on S.R. 85. The Refuge will provide you a welcome packet with the rules of the refuge. The conditions are extremely primitive and harsh. Four wheel drive is required on the Refuge. The refuge is primarily a wilderness area. A BMGR (Barry M. Goldwater Range) permit is required for access on to the Refuge, because of military over flights. The sheep from this area have a unique reputation for its red stained horns, as well as its horn size. This hunt is not for the meek and the weak. Increase UDA ( undocumented aliens) and drug trafficking is a reality; hunters should use discretion and good judgment where to hunt and camp. In the past, hunters have used horses to negotiate the terrain and distance you may have to travel to reach many parts of the refuge.